At my 30s, I’ve beginning to ask myself if I am aware enough of my surroundings or if at some point in the future, will I be wondering what have I done with my life, time or precious relationships. 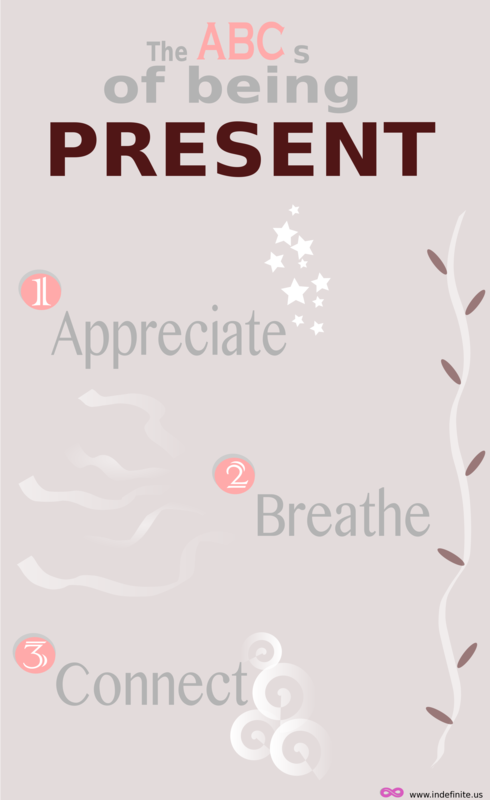 And, because I try to keep things simple and practical, I am going to abide to these 3 ways of being present. Being present means a lot to me at this point in my life. It means to be content with my lifestyle and enjoy all moments and experiences. It doesn’t mean I have to be happy all the time, for me, it’s just a promise to learn and follow my path. The one path I’ve decided for myself. Also, it means to respect my goals and others around me. Appreciate those good and not-so-good moments in life. The good moments bring you immediate happiness if you are aware of their value. Sometimes those little details in life are the most precious; those that don’t need spending money or investing too much effort. At times just being with your love ones make your day a better one. The not-so-good moments bring you satisfaction and YES they make you stronger, if you appreciate them for what they are: experience. It’s true that the value of failure is to learn how to be resilient and consistent in your efforts to do better. Once you learn to appreciate those experiences, you focus on gaining more than losing. Appreciate what you have instead of continuously desiring what you don’t. It’s good to have ambitions and strive for success in acquiring the things that you wish for. But be careful to find balance and still be content with what you already gained. It’s difficult to be an adult. Nobody talks about the real responsibilities to come with adulthood. At least for my generation and cultural environment, almost every parent told their kids to go to school, then to college, and finally to achieve success in the chosen career; to be successful you would need to be a doctor, lawyer or a business administration professional, preferably a manager. So, when you’ve succeeded early in life according to those standards, what’s next? You start to realise that life in itself is a lot more than your career. Of course, I am just writing about my personal experience and those close friends around me. Once you start to cultivate your relationships, you are thinking… this is more difficult than I thought and nobody told me. Why on earth did they forget to tell me this important fact: you need to balance many aspects as an adult. I already mentioned career and relationships, but there is also personal finances, family, among others… specially YOURSELF. So, there you have it, breathe throughout the challenge and enjoy the fact that you have a lot to deal with, as a holistic person. Breath and you will discover that balancing all those dimensions in life mean that sometimes you need to let go and focus little by little not everything at once. You will be fine. When you have a lot to deal with in your present and more goals to achieve for your future, it’s easy to disconnect from THIS MOMENT and enjoy the simple pleasures as they come. Due to this complexity, one tend to forget the quickest way to being present is to connect to your surroundings and more importantly to the people around you. Be present by connecting your feelings, be aware of them and relate to those details that make your day a happy one. Personally, I keep these three words close to me as a reminder that life is beautiful and simple to enjoy. Just practice this three habits and you will do great at BEING PRESENT. Your days will be more positive! What do you think? Do you have any other ideas to being present?